Let me begin my contribution by acknowledging the fact that Nigeria, its citizens and indeed the world have woken up to the reality of Biafra`s existence. And without prejudice, its credit goes to Nnamdi Kan, IPOB led by him, and other Biafra movements. Their activities and activism have brought about this. That having been said, let us now go into the real issues involved in this brouhaha. I will make an attempt to explain the two different schools of thought. A. Restructured Nigeria Will Offer Biafra Larger Spectrum To Operate: This is the position propelled by Ohanaeze Ndigbo led by Chief John Nnia Nwodo and some Biafrans who are really involved in Nigeria. They are of the opinion that a well restructured Nigeria will afford every Biafran and indeed themselves who have already aquired a lot of stake in the Nigerian society the opportunity to freely reside in any part, maintain their stakes, run their business empires and explore other grounds in the wider Nigeria without hindrance. This however, is the position of IPOB, and other Biafra agitators who indeed have endured several decades of exclusion, marginalization, oppressive federal policies, repression, killings and abuses and obviously most of whom have little or no stake in the present Nigeria. The viability of the former as proposed by Chief John Nnia Nwodo, Ohaneze Ndigbo leadership and their side of Igbo elites is not in doubt. What is in doubt however, is if the evil forces that have held Nigeria to ransom till date will ever agree to freely let Nigeria go via full restructuring. Signs to the opposite are rife already. Northern leaders like Tanko Yakassai, Professor Ango Abdullahi, Alhaji Junaid Muhammed, etc., their Northern leadership bodies like Arewa Consultative forum, Northern Elders Forum, etc., have all spoken against it in time past. It is also worthy of mention that it was the North`s firm refusal of same restructuring as proposed by Dim Chukwuemeka Odumegwu Ojukwu of blessed memory that led to the declaration of the defunct Biafra Republic. The North vehemently opposed any attempt to allow other parts of the country determine their future in the same geographical space called Nigeria. Even after they had gone to Aburi in Ghana and struck a deal otherwise known as the ABURI ACCORD to restructure Nigeria to a true federation so that the constituent units do not keep killing each other. The Northern leaders insisted and prevailed on Yakubu Gowon, the then military Head of State to renege on the agreement and instead preferred to use force to coerce everyone and hold Nigeria together by the barrel of the gun. And hence, since after what happened, they have refused to give up political power so they could perpetuate their plan. At present, this same path is being toed by same North. They have come under the name, Arewa Youth coalition and issued quit notice to Ndigbo living in all Nothern states to leave the North before October 1st 2017; almost exactly the same pattern they towed in 1966/1967 before they started the massacre of Easterners in the North prior to the civil war. A careful look at the said youths who gave the quit notice this time reveals men well advanced in age. And to crown it all, their elders, some of whom I have mentioned earlier have thrown their weight behind their ultimatum. Worthy of note also is the fact that the government in their capacity is doing nothing to stop them. The ones who gave their fellow countrymen quit notice are still walking freely and daring anybody to arrest them. The cause of this quit notice this time is the fact that the Indigenous People of Biafra have stated unequivocally that they want to leave Nigeria and have sustained the agitation asking for Biafra referendum to determine their fate. This in itself is a right recognized by both UN and Nigeria (Nigeria ratified and domesticated UN Chater that states indigenous people`s rights including that of self-determination). B. A sovereign, independent Biafra on the other hand as is being agitated for by Nnamdi Kanu, his IPOB, and other groups is also very viable in the sense there won`t be any government deliberate oppressive policies against them anymore. There won`t be fear of attacks, killings and destructions of lives and properties, families and livelihoods by Muslim irredentists anymore. There will be freedom to practice their religions, invest in their chosen fields without being emasculated by their own government through obnoxious legislations. Above all, they`ll be the ones to choose how they want to govern themselves and by whom. All these, Nigeria has denied them for decades now and it doesn`t even look like things are going to change anytime soon. As for the assertions that Biafra is landlocked and small in land mass hence won`t contain Biafrans, so many pundits have spoken in detailed analysis of this and effectively proven it to be a huge lie and a simple warped imagination of some uninformed cynics. So I am not going to waste my time on it in this write-up. I have read so many expositions on this subject that I have become sufficiently convinced that though Biafra comprises of both South East and South South, even in the worst case scenario of a Biafran nation consisting of only the South East, its territorial land will still be very viable and not landlocked. In this whole saga, whose interest is each group serving? While in his latest address to the Anambra State House of Assembly, Dr. Nwodo had chided Kanu for calling for a boycott of elections in Biafraland beginning with the November 2017 gubernatorial elections in Anambra State. He had disowned Kanu, stressing that nobody had the right to dictate for Ndi Anambra whether to or not to vote. Nigeria. Yes, we are not happy with our treatment in Nigeria. Yes, some of us want Biafra. Yes, some of us prefer a restructured Federal Republic of Nigeria. But the fact remains that we are still part and parcel of the person Federal Republic of Nigeria, bound by its laws, no matter how repressive or unjust”. My question here therefore is: Does the call for elections boycott breach any law or are there other reasons for this outburst by Chief Nwodo? A quick check reveals that a mere call for an election boycott does not breach any law as universal suffrage is a right of every citizen and it is the right of the citizen also to choose to either exercise it or withhold it. What constitutes a breach of the law therefore, is any attempt to try to prevent people from exercising this right against their will. In this case, I don`t see Nnamdi Kanu and IPOB trying to implement this call by any force. I however didn`t hear Dr. Nwodo comment on what the people are saying. I didn`t hear him trying to find out if Nnamdi Kanu`s position is popular among the people or Nnamdi is speaking on his own. A simple enquiry and opinion poll among the people would have been enough to give him the right position of his people as concerns the upcoming elections before venturing out to either condemn or justify it. To be candid, what I saw in that outburst of Chief Nnia Nwodo is the same attitude typical of Nigerian politicians who care not about their constituents but their business interests in Nigeria. To these people, it doesn`t matter what the people they profess to lead say or want, what matters is what they say or want. They believe they know better than those they lead and need not consult those being led before taking major decisions that concern them. I saw something that looks like a man trying to protect something dear to him from an intruder. While on the Nnamdi Kanu part, I saw a man trying to ride on his popularity among the people to achieve a set goal desired by the people. If I should draw my conclusions from here, I would say that Nnamdi Kanu`s call rather than Chief Nnia Nwodo`s overrule has more of the people`s backing. 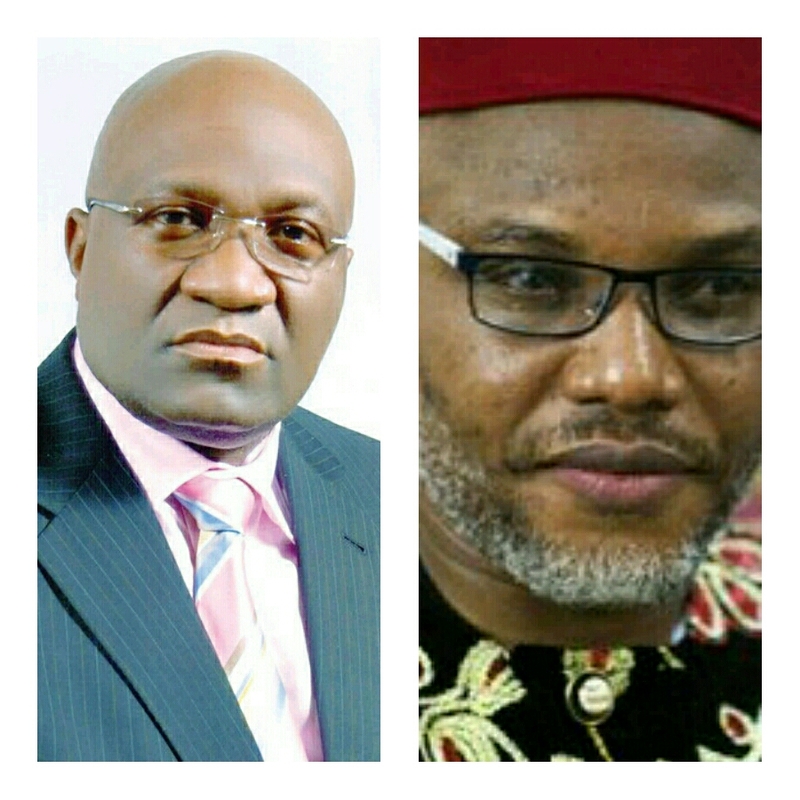 Let`s consider this part of Chief Nwodo`s address, "...Whereas Ohanaeze understands the marginalization and unfair treatment of Igbos which have given rise to self-determination movements in Igboland, leaders of these movements must not arrogate to themselves the supreme leadership of Igboland..."
Perhaps, my readers will see differently. Pray, what concerns the acknowledgement of the marginalisation of Biafrans as stated by Chief Nwodo with who leads the mission to remedy the situation? Is leadership more important than the plight of the people? By the way, who is a leader? Someone who collects a title? Someone who occupies a position of power? Or someone who influences people by identifying with them and solving their problems? Nnia Nwodo acknowledged that the problem is there. He also admitted that it is the problems that gave rise to the Biafra agitations. However, he has been around all these while the problems have persisted and almost consumed his people while they groaned, cried and scampered for help from anywhere until a certain young man living in far away UK could not bear it anymore. The young man left his comfort and family, committed his resources and even came down to Nigeria and went to prison just to save the same people who the Chief professes to be leading from total annihilation. Any doubt as to why the people idolize him? In that speech by Chief Nwodo, after acknowledging the problem and the fact that the problem is the cause of the people`s agitation, he didn`t make a single mention of the solution to the problem, he went straight to leadership. Really? Is that all that matters? Chief Nwodo has forgotten that IGBO ENWEGHI EZE, mana IGBO MA EZE. Nobody rules Igbo by force. If Ndigbo willingly follow you, then you are truly their leader. What I saw in that address is nothing but the outburst of a man who feels being outshined or that of a leader who is threatened by the popularity of an emerging power who rose to popularity by doing what the leaders could not do. The frustration and power tussle as betrayed in that speech was very obvious. In conclusion, I yet have so much to write on this context but suffice to say that the people of Biafra still reserve the right to choose who their leader is, where they want to belong, whether in Biafra or restructured Nigeria. A referendum in my opinion, will settle this once and for all. As for the elections boycott, the Biafrans also reserve that right either to vote or to decide not to in other to drive home their points. I`ll stop here for now.